Alex Quimby is an accomplished litigator who represents Fortune 500 companies, small businesses, and individuals in a wide range of business disputes concerning contracts, fraud, products liability, leases, class actions, and other matters. Alex has served as lead counsel in multiple trials and arbitrations, and has extensive experience taking depositions and arguing complex issues in state and federal courts. 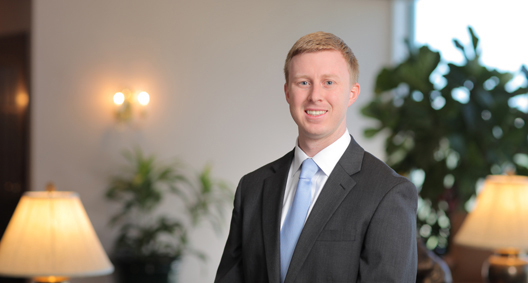 Alex was named a Florida “Rising Star” by Super Lawyers Magazine, an honor given to no more than 2.5 percent of the lawyers in the state each year. Lead counsel on behalf of company in five-day trial involving claims of tortious interference, breach of lease, and eviction (judgment pending). Handled all aspects of litigation, including taking and defending numerous depositions of fact and expert witnesses, drafting of pleadings and drafting and arguing of motions, and conducting mediation. Involved in representing Irving H. Picard, Securities Investor Protection Act (SIPA) Trustee for the liquidation of Bernard L. Madoff Investment Securities, LLC, in connection with BakerHostetler's role as court-appointed counsel. Lead counsel on behalf of individual in two-day trial against custom automobile shop that resulted in final judgment for entire amount demanded. Lead counsel on behalf of commercial landlord in arbitration proceeding against tenant that resulted in arbitration award, and subsequent final judgment, in favor of landlord on all claims. Lead counsel on behalf of individual sued for wrongful death in court-ordered arbitration that resulted in determination of no liability. Represents a publicly traded company and commercial property owner in various construction and lease disputes. Experience includes obtaining dismissal of a plaintiff's claims with prejudice in a suit attempting to rescind a lease and obtaining summary judgment against a plaintiff in a suit concerning the build-out of premises and an alleged breach of lease. Lead counsel in defense of a store owner sued for breach of contract that resulted in a favorable settlement for a nominal, undisputed amount. Represents one of the world's largest energy companies in various actions. Drafted motion to dismiss resulting in dismissal with prejudice of a gross negligence claim asserted in a plaintiff’s initial complaint. Defends publicly traded company against negligence and products liability actions concerning allegedly defective equipment. Substituted in as lead counsel in the defense of individuals who were sued for securities fraud and other claims more than five years earlier. Obtained dismissal without prejudice of the plaintiff’s claims shortly thereafter and then quickly obtained a favorable settlement for a fraction of the plaintiff's alleged damages. Defended an individual sued in federal court for alleged violations of the Computer Fraud and Abuse Act and Computer Crimes Act. Successfully opposed a request for preliminary injunction and drafted a motion to dismiss the claims. The case was resolved after voluntary dismissal of all claims with prejudice. Defended a major hospitality company in a putative class action filed in federal court for alleged violations of the Telephone Consumer Protection Act. Did significant research and drafting on key matters, including drafting a motion to dismiss the complaint. The case was resolved without class certification after the plaintiff dismissed his claims. Defended a hotel and resort company in a class action filed in federal court for alleged contractual violations. Drafted a memorandum in opposition to class certification and provided key research on the Class Action Fairness Act and other matters. The case was resolved without class certification after the plaintiff dismissed his claims. Defended a property owner in a putative class action filed in federal court for alleged violations of Title III of the Americans with Disabilities Act. Provided key research and drafting in support of arguments to dismiss the complaint and strike class allegations. The case was resolved without class certification after the plaintiff dismissed his claims. Defended and advised various companies facing class action claims brought under the Telephone Consumer Protection Act. Provided key research and drafting of dispositive motions at various stages of litigation. Successfully defended a nonprofit organization in a breach of contract dispute.